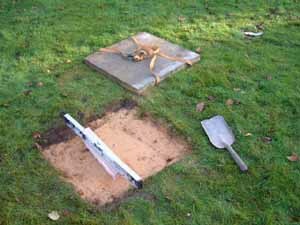 The instructions and pictures below refer to mounting the plinth on a level paving stone. 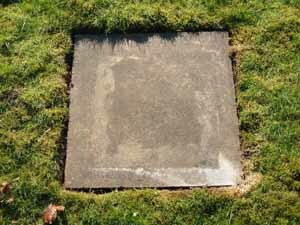 If you are certain that you will not want to move the sundial to another part of the site later, it is preferable to cast a small slab of concrete of around 6 in. 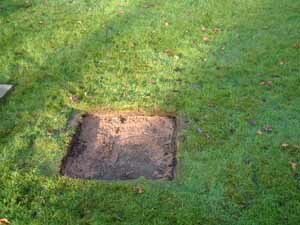 depth and rather wider than the plinth, and use this in place of the paving stone. 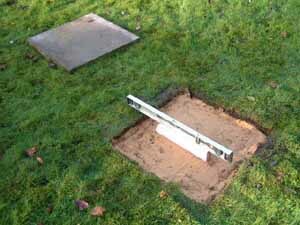 This will ensure that the plinth does not get misaligned in the future due to underlying soil movements. Before fitting the gnomon to the dialplate, please check that there is no grease or oil on the tenon which fits into the dialplate, and that there is no debris caught in the air gap between the two plates. It is advisable to clean both areas with a tissue soaked in lighter fuel to be certain of this, in order to avoid marks on the dialplate. 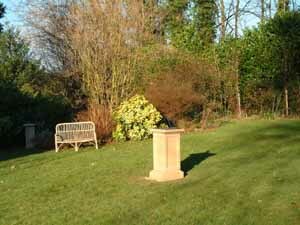 The sundial needs no maintenance apart from cleaning. 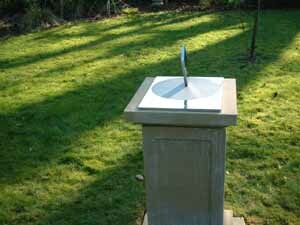 Never use any kind of manufactured cleaner - they will all put scratches on the stainless steel surface. 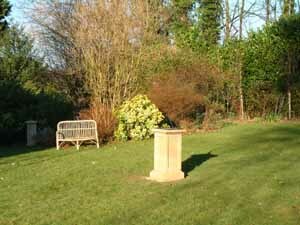 A very soft cloth and warm water is the best method. With any stubborn marks, use lighter fuel with a soft cloth. Most marks will eventually wash off in the rain anyway. 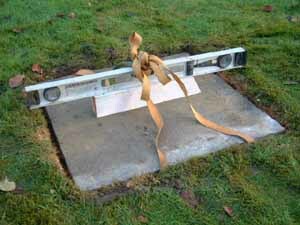 Details of the dimensions of the baseplate and its fixings are given here. 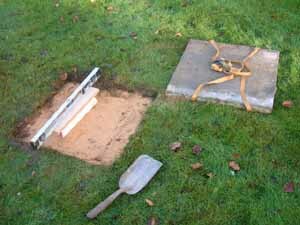 Hold a flat board resting on the paving stone, and also against an edge of the plinth. 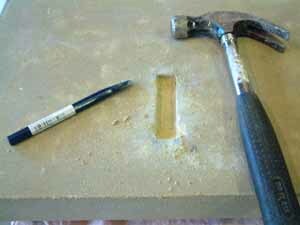 Make sure it is accurately vertical. 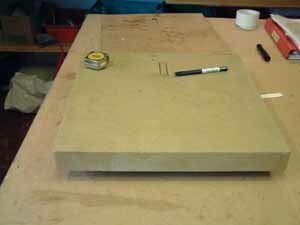 Mark the outer edge of the board with spray paint or marker pen. Repeat with the other 3 edges. 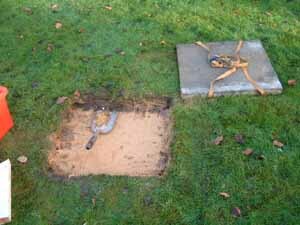 Lift the plinth top off the paving stone. 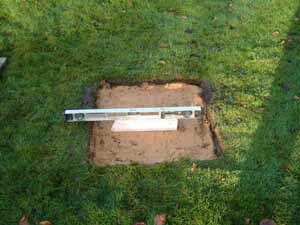 Using an 8 to 1 sand/cement bedding mortar, apply mortar all round the base to ensure that it cannot be twisted out of alignment. 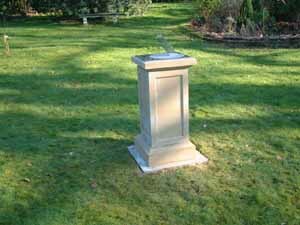 Align the plinth top so that its edges are in exactly the same direction as the base. If you are at all doubtful about the alignment of the base, wait for the next sunny day and check that the line of light falls exactly centrally (as in 6 above) at the time of solar noon on that day. 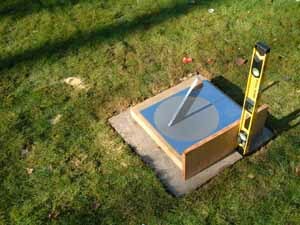 These photographs show the sequence of operations involved in setting up the Spot-On Sundial in stainless steel. 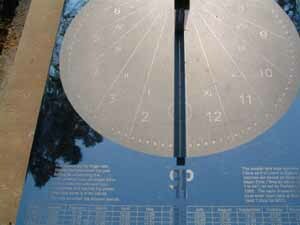 You need to print out the Solar Noon calendar for your exact longitude before you start. 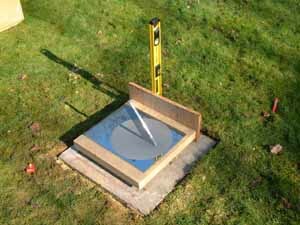 You should be particularly careful about the levelling in the east-west direction; errors here have twice the effect on the accuracy of the sundial as errors in the north-south direction. 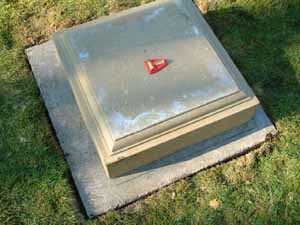 The bottom section of the plinth is then placed on the paving stone, lined up accurately with the pencil line, and cemented into position.